We couldn’t be happier with our new home thanks to the Bali Team. Laura listened to what it was in a home that we were looking for and she found it! 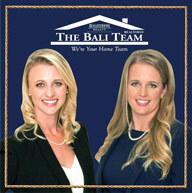 The Bali team was there to answer any question we had and they made the entire home buying process stress free. I would suggest their services to anyone looking for a home.